Bamboo is ubiquitous in Chinese culture. Sturdy and tenacious, it symbolises virtue. In fact, the plant has had a profound impact on the daily life, culture and spirituality of the Chinese. In the past, a wide variety of products were made from bamboo - from roof tiles and rafts, to shoes, furniture and agricultural tools. But despite the close relationship between Chinese-speaking societies and the natural material, Taiwan's bamboo industry has suffered a decline in recent decades. It nearly collapsed because of people's preference for more modern-looking products, or just cheaper plastic goods - and the impact of less expensive bamboo imports from China and South East Asia. Nowhere was this more apparent than in central Taiwan's Zhushan or "Bamboo Mountain" town. Hundreds of families used to make bamboo products there in the centre of the country's bamboo industry. Now there are only about 50. 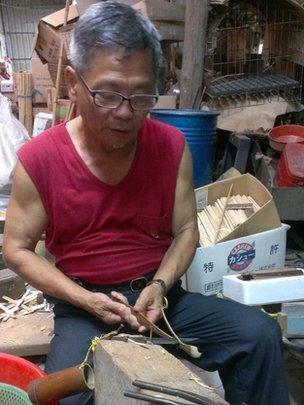 It's a trend reflected in other parts of Taiwan - only about 240 bamboo-products businesses remain on the island. "In the past, every part of Taiwan had people working in this industry, but over the years, bamboo has been replaced by plastic or steel to make all sorts of products, such as clothes hanging poles, baby cribs, and furniture," says Yang Chun-hsien, director of the Forestry Bureau's reforestation and production division. However, an earthquake and strong resolve on the part of the government and industry to continue using bamboo have led to a revival and transformation in its use. In recent years, bamboo has been used to make items never before associated with the plant - from shampoo and insect repellent, to socks, gloves, and even roasted peanuts. This reinvention of how bamboo is used has made it possible for the small family businesses which make up the industry to stay alive and to start reversing the decades of decline. At the height of bamboo production in Taiwan in the 1970s, more than 13 million stalks were harvested each year, and sales of the stalks alone - not including the finished products - amounted to $3.5m (Â£2.1m) per annum. But in the past decade, the annual harvest amounted to only about 1.67 million stalks with sales adding up to just $456,000 - a little over 10% of the peak level. Production and sales, however, have been steadily climbing in recent years. Following a devastating earthquake on 21 September 1999 centred in Nantou county, where Zhushan lies, the central government decided to help the local economy by commissioning the country's non-profit Industrial Technology Research Institute (ITRI) to find new ways to help the bamboo industry grow. ITRI developed a method to carbonise bamboo stalks to produce high quality bamboo charcoal, which has a multitude of different uses. Naturally insulating, the charcoal can be turned into fibres and woven into fabric to make hats, scarves, gloves, socks and pants. Also said to be health giving, it is increasingly added to bodycare products, such as skin creams. Yet its most unusual application has to be in the production of bamboo charcoal-coated peanuts - which look exactly as they sound - peanuts covered with charcoal. Many people who have never tasted them are queasy about giving them a try, but they actually taste good, not at all like charcoal, and are believed to have health benefits. Such diversification has bought new hope to Taiwan's bamboo industry. "When I was growing up, the toys we played with were made of bamboo," says Chen Ching-fu, general manager of the Bamboo Culture Park in Zhushan - a manufacturer of bamboo product, and the first visitor attraction in Taiwan devoted to the plant. "Bamboo was all around us, but never did we imagine bamboo can be used to make so many different types of products." Like other businesses, Mr Chen's now sells not only traditional bamboo furniture, but other products such as air fresheners and clothing. Besides bamboo charcoal, the Taiwanese have also found ways to use the actual bamboo to make a much wider variety of products than their ancestors did, including floor panels, pens, clothes hangers and even laptop casings. Sales of goods made from all forms of bamboo in Taiwan now reach $100m, with exports increasing alongside domestic sales. One of the trends helping to drive the revival of the industry is the return of second or third generation young people to help run family businesses. Lin Li-wei, 36, worked at a post office in the capital Taipei after graduating from college. But, making only about $600 a month, he came back to assist his father, who made bamboo ear diggers used by Chinese and Japanese people to remove earwax. 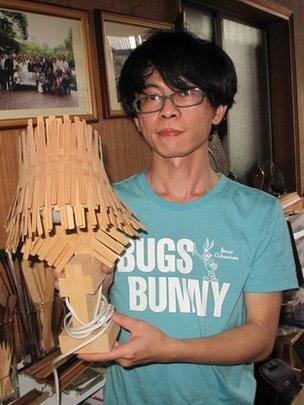 He's now put a new spin on the family business - making modern looking clocks, lamps and wall lights out of bamboo. He has been receiving orders for his creations. "My father supports me trying to innovate," says Mr Lin. "Only through innovations can we add value to our products and continue our business." Now he and his father make $5,000 a month. Many of the manufacturers in Zhushan are breaking even, but not making big profits. Still, they persevere, seeing it as their mission to continue to promote the use of bamboo. Bamboo grows fast - just five years to reach maturity, making it one of the most environmentally-friendly plants to use. So growers and industry leaders hope they can replace the use of many types of other wood, and plastic. "Plastic is very cheap and can be used for a longer time, but what a shame. Bamboo is more environmentally friendly, no chemicals are used to make bamboo products, and the trees grow without the need for fertiliser or pesticides," said the Forestry Bureau's Mr Yang. "Bamboo can also absorb a lot of carbon dioxide and can reduce greenhouse gases." Back at the Bamboo Culture Park, Mr Chen has created a do-it-yourself workshop where schoolchildren and other tourists can learn how bamboo charcoal is made and make their own bamboo products. "Taiwan can't be without bamboo because it's a material we've relied on for generations," says Mr Chen. "I want to help people understand the importance and benefits of using bamboo."